This summer/spring/whatev three new frozen yogurt places opened in Berkeley. Which was a disaster, a pretty awesome disaster, but a disaster, cos there were weeks when I had a frozen yogurt every. single. day. I know, I know, Yogurt Park has been in Berkeley forever, but the thing is, Yogurt Park serves the traditional frozen yogurt which tastes like frozen custard or soft serve, but the new yogurt places are trying to follow the PinkBerry craze, y’know, with the tart, tastes-like-yogurt frozen yogurt and with toppings. I’m not saying I don’t still go to Yogurt Park, ’cause I totally do when I’m in the mood for that sorta thing, but to me, it can get a little too sweet sometimes, almost cloying. The tart yogurt though, it’s good any ol’ time. Which is the problem. Of the tart yogurt places, I like Yogurt Harmony on Shattuck (between Bancroft and Kittredge) — I think it’s a good balance of sweet and tart and creamy. Usually I just get a plain tart flavored yogurt with no toppings (they have other flavors of the day like lychee, peach, mango, or pomegranate, usually 4 flavors total, but it changes daily/weekly), but after I tried some mochi topping when Julie got it, I’m a convert. (She also recommends Cap’n Crunch and strawberry, which is rather good too.) Anyway, they charge like 95¢ for the first topping and $1.25 for 2 toppings, so I always get at least two toppings if I get toppings, cos that’s how I roll. 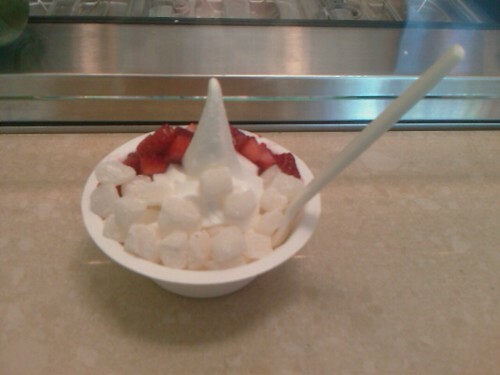 This week’s been hot, which brings frozen yogurt to mind. Well it does for me! I wish we had that where I live. Unfortunately, the closest thing to a tart frozen yogurt here is going to the grocery store and getting Stonyfield Farms’ frozen yogurts. It’s sooOO good! I can’t wait to visit you so I can eat this daily. I’ll just have this, gelato, and crepes. Oh, and sushi. And that cake shop. I’m keeping a growing list.